'Mamma Mia! Here We Go Again,' My, My How Can I Resist You? I understand the appeal of jukebox musicals. Sometimes (OK, maybe most times), I much prefer going to a dive bar with a great jukebox over seeing a new band at a local club. There's comfort in the familiar, and knowing ahead of time how an evening's songs will make you feel. One's enjoyment of the Mamma Mia! movies will, of course, depend, a lot, on one's tolerance for ABBA's musical catalog. My tolerance is pretty high, so, while I found the first film's plot a tad insipid, and the musical performances ranging from adequate (Meryl Streep; Amanda Seyfried), to excruciating (Pierce Brosnan), I still had fun watching it, if only to see which ABBA song would be force-fed into the plot next. Of course, the soundtrack for that first film consists almost entirely of ABBA's greatest hits, which would seemingly leave Mamma Mia! Here We Go Again with the choice to either rehash those numbers, or reach deeper into the ABBA catalog. It does both. 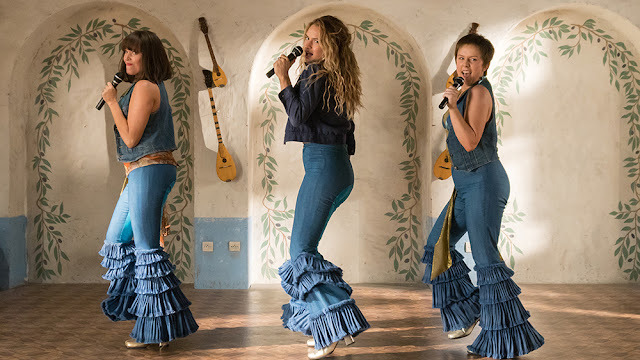 The film serves as both a sequel and prequel to Mamma Mia! In the now, Sophie (Amanda Seyfried) is re-vamping and re-opening the hotel in Greece her mother, Donna (Meryl Streep) spent the majority of her life working on. Will her three dads (Pierce Brosnan, Colin Firth, Stellan Skarsgård) make it to the opening? Will her boyfriend, Sky (Dominic Cooper)? Will her estranged grandmother? (Spoiler alert, she's played by Cher, and she's on the poster and the trailer). Or will weather ruin the whole event? Since that's the extent of the drama in that plotline, the real soap opera plays out in the past, as we follow young Donna (Lily James) during that fateful summer in 1979 that led to Sophie's birth. Somehow, we're to believe someone who looks like Lily James grows up to look like Meryl Streep, which, yes, is preposterous, and we must also take the casting of the younger versions of her suitors with an equal grain of salt. It's only Jessica Keenan Wynn who is utterly convincing in the flashback scenes as the young Tanya (Christine Baranski). Thankfully, these younger avatars have stronger voices than some of their older counterparts, which helps to justify the casting. And Lily James manages to turn a potential manic pixie dream girl into someone who feels much more lived-in and relatable. You don't doubt the infatuation of her three suitors. So while there are some greatest hits reprieves here, (it was hard not to sing along to "Dancing Queen" this time, especially when it turns into a dance number performed by hundreds of people on the island's docks), there are also more organic feeling numbers, like "When I Kissed the Teacher," which Donna performs alongside her pals Tanya and Rose during their graduation from Oxford, (look for a cameo by ABBA's Björn Ulvaeus in that scene), and "Angeleyes," which gets a very theatrical rendering by Christine Baranski and Julie Walters. And then there's Cher. To say her character in the film is ridiculous (she's supposed to be Donna's mother; Cher is two years older than Meryl Streep), is to just recognize the appeal of casting her. The movie grinds to a halt for her performance of "Fernando," as well it should. You may groan at the obviousness of the number. You may role your eyes a bit. But you'll be smiling the whole time. And that goes for Mama Mia! Here We Go Again as well.